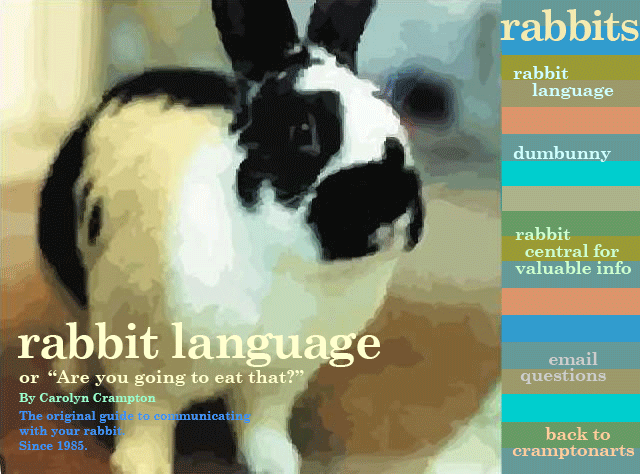 Rabbit Language or Are you going to eat that? written and illustrated by Carolyn Crampton. A humorous and informative guide to communicating with your pet rabbit. The original guide has been online since 1995. Dumbunny, written by Mary Ann Wolf and illustrated by Carolyn Crampton. Ladybird: My Eight Lives, by Carolyn Crampton, Howell Park Press, 2016. Help for rabbit owners, visit Rabbit Central. For all urgent health questions please contact a vet.